Will Seventh-generation iPod nano have rear-facing camera? 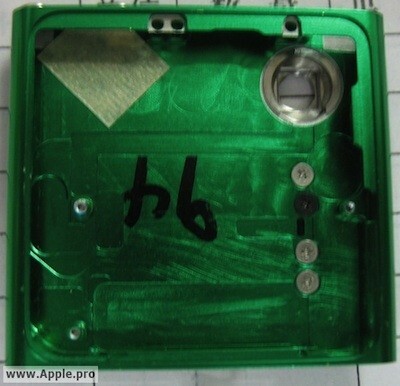 Taiwanese Apple.pro has posted an image which it claims is the rear casing for the next iPod nano. The purported casing shows a hole which would house a rear facing camera. For those who think this might just be another fake, please remember that Apple.pro has a long and fruitful history with iPod nano rumors, they were the first website to post an image of a small touchscreen which later made its way into the sixth-generation iPod nano that debuted last fall. As noted by MacRumors, when the sixth-generation iPod nano was unveiled, many loved its new form factor, but some lamented over the loss of the camera which was found in the fifth-generation iPod nano. If Apple.pro’s image is legitimate, it looks like Apple is trying to combine the best features of the two previous nanos into one. It will be interesting to see the final product and whether it will actually feature a camera or not, we will keep you posted on any new rumors in this area.